The Child and Youth Mental Health services includes assessment, counselling and case planning for children and youth with depression, anxiety, family conflict, unmanageable behaviour, or other mental health concerns in home, school or community. The service provides specialized clinical interventions and support and follwup in office or on an outreach basis. The Child and Youth Team work closely and consult with Dr. Jessica Moretti, a child and adolescent psychiatrist who is on site one day a week. Staff also provide consultation on mental health issues for others working with children and youth. The program is aimed at children and youth under 19 years of age residing in the Gulf Islands who present with moderate to severe emotional, behavioral and/or psychological difficulties. Services are provided from the Salt Spring Island Community Services building at 268 Fulford-Ganges Road. The building is wheelchair accessible and has private counselling offices and group/family meeting rooms. Services may also be provided in community locations including schools. The services can be accessed through Salt Spring Island Community Services offices at 268 Fulford-Ganges Road. The telephone is (250) 537-9971. Referrals are accepted from Ministry of Children and Family Development, schools and community agencies. 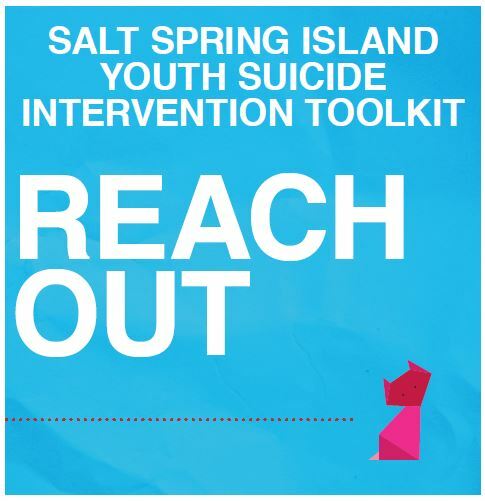 These toolkits were initiated and developed by Salt Spring Island Community Services to help parents, caregivers and professionals, like teachers and healthcare providers, reach out to children and youth who may be at risk for suicide on Salt Spring Island as well as for youth themselves. The toolkits were produced by The Child and Youth Mental Health & Substance Use (CYMHSU) Collaborative, funded by the Shared Care Committee in partnership with the General Practice Services and Specialist Services Committees of Doctors of BC and the BC Government. The goal of the collaborative is to increase timely access to integrated services and supports for children, youth and families struggling with mental health and substance use issues.